I'm up at 6:40 am or so without an alarm. I wander up to the outdoor pool; follow a sign to the WC, and freshen-up. I head toward the restaurant where the staff invites me to eat from the breakfast buffet. There's quite a crowd already gathered-seems that a busload of Polish tourists is getting an early start. They're pretty cranky-repeatedly complaining to the management that the rolls should not be served sliced, pushing and shoving to get to the tea, etc.. I'm glad I'm not part of that tour. Getting to the main road heading south was as easy as promised: continue 2 kilometers in the direction I've been headed, then take the onramp. Shortly thereafter a sign reads "Der'a - 95 k." Per my map it should have read 85 k, so I'm still dealing with map inconsistencies. Oh well. I'm not thrilled by the distance, but there's a reference to bicycling this stretch in my old Istanbul to Cairo Lonely Planet book, and it says, "it's a really fast ride." Well, it isn't. The headwind has me quickly worried about just how long a day it's going to be. Then I notice that I haven't seen a roadside soda/snack stand for a while. I take a 9:30 am break under a tree-the sun's already hot. Then around 11am, I again take a break under some trees. At noon I stop briefly at one of the rare overpasses. Within seconds after getting back on the bike my front tire goes flat. Maybe a half hour earlier I had pulled a piece of wire out of my tire, so who knows if this has something to do with that. I need to get away from the noise under the overpass, and replace the tube in the open, about 15 meters from the cars. I notice again how hot it is. I also note that there is no way I could ever find a hole in a failed tube. It's too noisy-the cars and the wind. This might be a problem, because it means that if there is a second flat today, I'll need to find another way to get to Der'a. The new tube in, I ride on. I'm in a low-fluids situation again, and searching for a beverage stop. I stop at the first set of stands in hours. I pick up another liter of water and rest for about 10 minutes. It's too bad the place smells of feces. The wind has me in the fowl mood and the string of descriptors for the day would have to include heat, dust, vehicle horns, flies, the smell of rotting road kill, and now: sh**! I ride another few kilometers and I see a large billboard advertising a restaurant, supermarket and a rest stop! I pull in there and the restaurant is clean and classy. I have a great chicken and rice plate and as I'm leaving I pantomime a flat tube and a bucket of water. My hope is to use the bathroom sink, but I'm directed outside to a different building: "Follow me". I'm a bit cranky by what seems to be a run-around but I dutifully follow. I've been taken over to the mechanics, where there is a bucket of water is provided, and I quickly find the hole. The crew watches as I find, then patch the hole. They gesture for me to follow them again, and I do-inside the shop to a padded vice that they must use when they're patching tires. I want to be agreeable, but I decline. Even though "firm pressure" is part of the directions on my patch kit, I can't risk any damage to my one remaining tube. As I pull away I ask how far it is to Der'a. The men agree that it's 30 k, so in spite of the miserable wind and the number of breaks I've taken, somehow I'm getting there. I take a turnoff labeled "Der'a - 14 k." I'm heading east now, and somehow still battling that headwind. 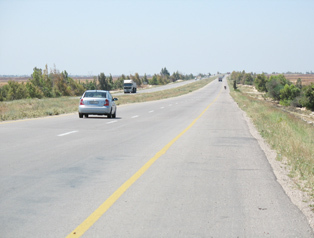 This road looks too desolate to support a town large enough to have a hotel, but I have no choice. Soon enough I'm in a decent-sized town. After a few "Otel?" inquiries it all comes together quickly. Left at the traffic circle and look to the right and WOW! There's what looks like a very nice business-hotel. I've already been told that there is just one hotel; so let's see how much this place is going to be. I take an elevator to the third floor and the place is classier than anything I've stayed in so far (OK - That's not saying much.) I complement the facility, am shown a very nice, but dark, room and suggest that it might be too much money for me. "Dollar or Syrian Pound?" they ask. I say "Dollar". There is some talk and I'm offered a room for $30. I jump on it and soon settle in, taking care of chores before relaxing. I spread out the tent on the bathroom floor to air-dry the bottom; I wash socks and underwear; I revisit the tube's patch-job from earlier, adding a bit of glue to the corners; I take a shower (hot! ); and I head out to check out the town. I like this town. The downtown's bustling, and I have fun visiting different street vendors, picking up nuts, bananas and other snacks. There's an internet café just across the street, and the hotel itself has a nice restaurant on the second floor, and a fast food restaurant on the ground floor. 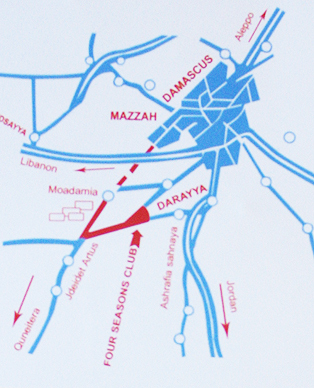 The map on the back of the Four Seasons Club brochure. The ride south is miserable: boring, hot, and few provision-points. Basic Microsoft commands become a bit more confusing when they're in Arabic.